Pre-populate your app with attendees info to make the registration easier and/or restrict access to the app to particular emails only. Manual Entry - Add attendees one by one, the only required field is the email (which is used to authenticate users). You can also fill out additional profile information like name, company, position, contact information, etc. Bulk Import - You can bulk import your attendee list from a CSV file, we provide a template for you to fill out. 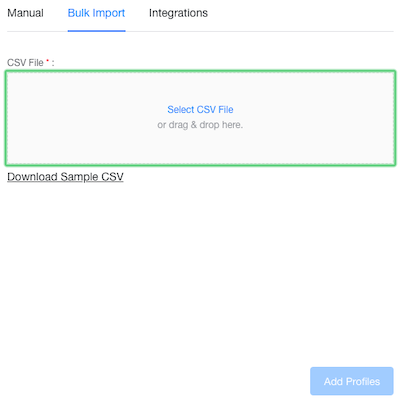 You can export a CSV with your attendee list from virtually any registration platform including Cvent, eTouches, RegOnline and others and upload the data via our template. 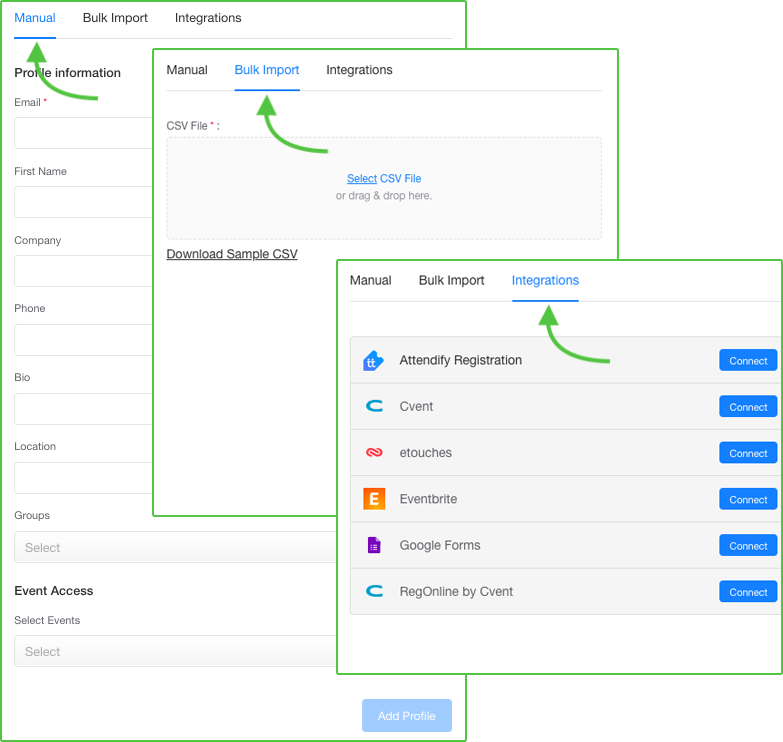 Integration - If you're using Attendify Registration, Eventbrite, Cvent, RegOnline, Google Forms or eTouches to manage registration for your event you can automatically pull in your attendee list. Detailed instructions on how to set up the integration with one of these solutions are available in this article. Note: Enabling attendee list automatically locks down application's content for all unregistered users. Learn how you can upload an attendee list to a specific event in your Multi-Event App here. Step 1. Select the "+profile" button and then select bulk import on the pop-up screen. 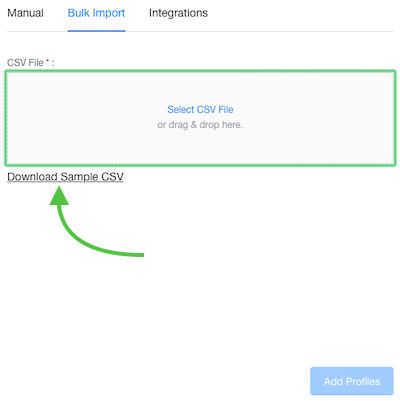 If you are just starting on uploading profiles to the app make sure that you refer to the sample CSV so you can see how the document should be properly formatted. If you are using our template you will see a column titled photo. This is where you will place the link for the photo. Note: All photos should be hosted on a secured HTTPS (not HTTP) server and this should be direct download links to publicly opened files. Back on the profile screen drag and drop or select the file in CSV format to upload to the app. Then select add profiles to upload the profile. Once that is done the photos will show in the profile space on their profiles. If you have any additional questions, feel free to contact us at support@attendify.com.